Westfield SE in yellow, carbon front cycle wings and carbon rear arch protectors. Mintex 1144's in Ford Capri GT calipers. 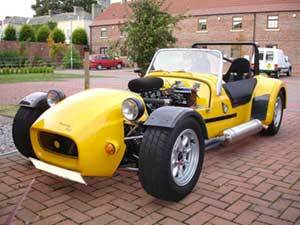 Engine - 1999 R1, just had a full rebuild (to make as new engine) - new gaskets, shims, shells, rings, bearings etc, 2001 Carbs (full setup by Dave Bogg), has mild tuning, gave 154bhp at the wheels (approx 175bhp at the crank). Barnet race clutch (new 2008), upgraded springs and plates, very driveable. Tony Law race headers with Wunoff repackable brushed stainless silencer (new 2008), approx 96db. Bailey Morris straight through prop with centre bearing and TRT which lines up perfectly with the 3.54 diff. Car has had a full setup, corner weighted and balanced, ride heights, full suspension setup (balanced neutral setup) inc toe, camber etc. Handles perfectly, very quick indeed, out performs Blades and very close to a Busa. Ultra reliable, sits at 75/80 degs all day long. Car comes with complete history from build to present. Had an R1 engine in the car for the last 5 years, have owned the car for 9 years, cheap Tax and insurance £112 for me for the year! Comes complete with 1/2 doors (fitted), full doors, half tonneau, full tonneau, roof, roll bar with frame. 2nd set of 13" alloy wheels (Alley Cat Race with Yokohama A021R's for track use). Box of spares includes rectifier/regulator, oil cooler, clutch puller, coil packs, oil.